In order to participate in Club Open Play on Monday - Saturday from 8 AM - 10 AM or in any of the drill clinics, you must be a member of the Quail Creek Pickeball Club who has paid dues for 2017. If a person is here for a short time (either visitor or renter) and wishes to participate, he/she may become an Associate Member of QCPC for 30 days. The cost of Associate Membership is $10. Contact Susan Jones to become an Associate Member, sejones1003@yahoo.com.You can also join as a full member by contacting Susan. Separate drill clinics will be available for 3.0 players and for 3.5 players. Eight players may participate in each clinic. The clinic for 3.0 men and women will be on Tuesday, 10/24, from 2:00 to 3:00 PM. Sign up here for the 3.0 clinic. The clinic for 3.5 men and women will be on Tuesday, 10/24, from 3:00 to 4:00. Sign up here for the 3.5 clinic. Clinics will be held on Courts 11 and 12. Round Robins are on Wednesday mornings. Separate Round Robins will be held for Men, Women, and Beginners. Sign-in between 7:30 and 7:50, and be ready to play at 8:00 AM. A social will be held along with the Round Robin. Coffee, cold drinks, and snacks will be available in the Ramada. Join your Round Robin group along with others to relax during byes and between and after games. Please bring a snack to share. Beginner I drills are Saturdays from 12 noon - 2 PM on Courts 5, 6, 7, and 8. Beginner II drills are on Tuesdays from 12 noon until 2 PM on Courts 9, 10, 11, and 12. No sign-up is needed for beginner drills. 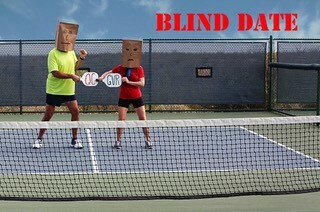 If you have attended referee training, we need you to help referee at the Blind Date Tournament on November 11-12. You may select the level of play at which you fell comfortable refereeing. Players may also referee. There is an option to "Referee when done playing." Click here to sign up to be a referee.